Notepad has 50 sheets of paper, each one displaying Bible verse 2 Corinthians 13:11, The God of love and peace shall be with you. The attractive cover protects the paper and has a magnetic closure. Pen stays handy and securely in place in the elastic loop. Keep in purse, glove compartment, at your desk, on the counter or anywhere you may need to jot a note! 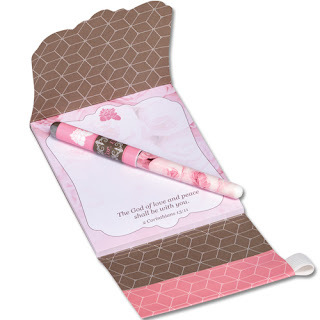 These useful and attractive Christian gifts for women will be sure to please! 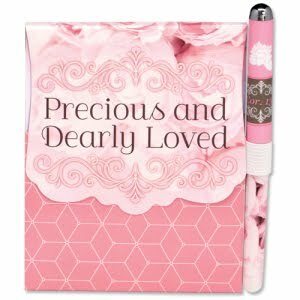 Give out during Mother's Day services, at women's retreats or Bible studies, hand out during special luncheons or dinners.